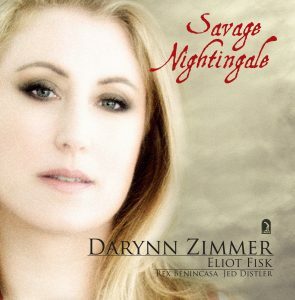 Spanish, French and Native American folk music collected by Federica Garcia Lorca, Jules Tiersot and Charles Wakefield Cadman all go to make up a rich and passionate album by Darynn Zimmer and her distinguished collaborators: guitarist Eliot Fisk, percussionist Rex Benincasa and pianist Jed Distler. Among the featured cuts are the flamenco songs ‘En El Café de Chinitas’ and ‘Anda Jaleo’ (‘Let’s Make a Racket’) which became an anti-Franco anthem in the Spanish civil war as well as part of a couple of famous flamenco ballets; also included are a couple of racy medieval French lyrics and Cadman’s American Indian-inspired ‘From the Land of the Sky-blue Water’, one of the most popular songs in American history. This disk contains some exquisite art songs by Massenet and Gounod, many of which are hard to find in any other French art song collections. They are interspersed with the songs of two 20th century composers, Louis Beydts and Maurice Delage. 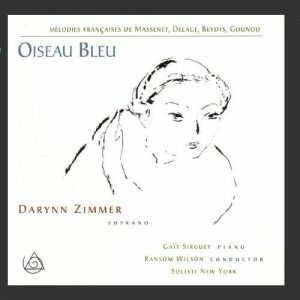 Beydts’s music is quite lyrical and tonal, reminiscent of the later songs of Reynaldo Hahn – the real jewel is his “L’Oiseau Bleu” (also the title of the CD). The high point of this disk is Zimmer’s performance of the Massenet songs. It is no wonder the most singers have ignored these songs, the lyrical melodic lines that soar thru the upper register must be quite a feat, and Zimmer makes them sound effortless. She sings Massenet with the same technical brilliance as Beverly Sills and with incredible clarity of tone and warmth. 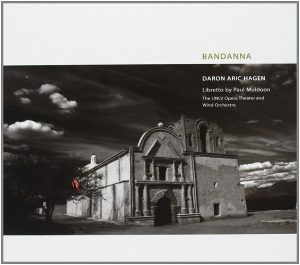 Bandanna recasts the tragedy of Othello as the story of Miguel Morales, Latino police chief of a tiny town straddling the Texas-Mexico border, his wife Mona, her girlfriend Emily, two of his officers, Jake and Cassidy, and Kane, a corrupt union organizer. Jake, who is resentful of Cassidy’s advancement over him, is playing a dangerous double-role as policeman and guide to successive groups of illegal immigrant workers. With the encouragement of Kane, Jake determines to convince Morales that his wife, Mona, is having an affair with Cassidy. Mona’s bandanna falls into the wrong hands, jealousy provokes Miguel to strangle her with it, shoot Jake, and ultimately, himself. The curtain falls on this desolate scene.